Dubai: His Highness Shaikh Mohammad Bin Rashid Al Maktoum, Vice-President and Prime Minister of the UAE and Ruler of Dubai, on Monday received General Qamar Javed Bajwa, Pakistan’s Chief of Army Staff. Shaikh Maktoum Bin Mohammad Bin Rashid Al Maktoum, Deputy Ruler of Dubai, was present during the meeting held at Zabeel Palace. 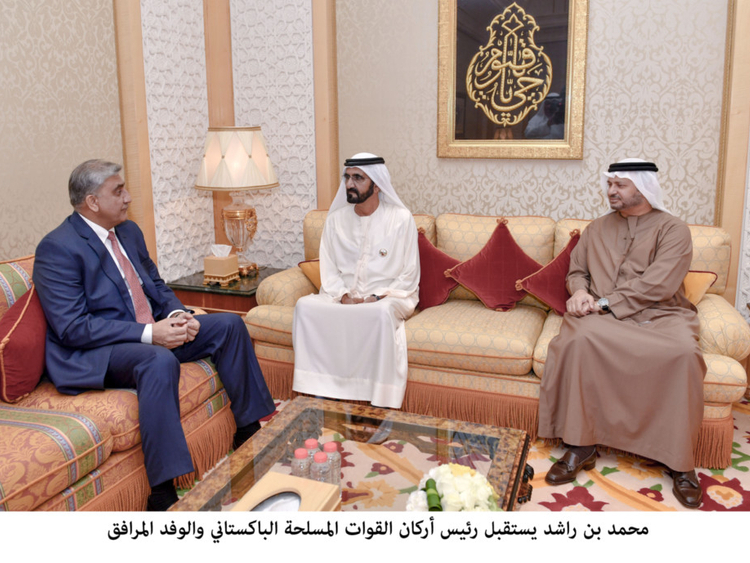 Shaikh Mohammad and General Bajwa discussed relations between the UAE and Pakistan, and a number of issues pertaining to the military, and the current situation in the region. General Bajwa praised the development witnessed by the UAE in different fields. The meeting was also attended by Dr Anwar Mohammad Gargash, Minister of State for Foreign Affairs, Shaikh Ahmad Bin Saeed Al Maktoum, President of Dubai Civil Aviation and Chairman and Chief Executive of Emirates Airline and Group, and other officials.